"I have a special fondness for Joni Sternbach's unique tintype images. 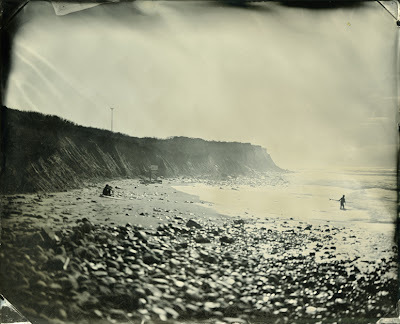 Having lived in *Montauk for over 15 years, many of Sternbach's photographs were taken just down the cliff's from us at 'Turtle Cove' and 'Ditch Plains', and I recognize some of the locals in her book SurfLand. But it's the beauty and expertise of her wet-plate technique that really sets Sternbach's work apart from the rest of us." maybe the most universal kind of photography i have ever seen ... they seen to have no time , culture , race ....but belong to all at the same time . thank you so much for showing this .... really .... now i want to "gig' these images as much as possible . I don't use this word too much but I find the photographs charming. Truly amazing ! I love tintypes and these are rather unusual... thanks for sharing. 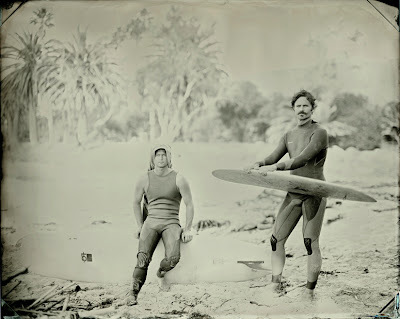 Surfers, like musicians are often entities unto themselves - combining the subject with a medium most artists would not venture near is an inspired combination. I had to stop and look again, believing these were taken perhaps in the late 1800s! Beautiful and delicate, I am reminded of Julia Cameron's work -- Montauk is a beautiful place (I grew up on eastern Long Island) -- beaches and ocean were part of the daily life back then! really cool photos. Quite a blog that I need to go through as I have time. Real talent and nice to know that the 'manual' techniques are still alive and as irreplaceable as ever! these are amazing. I love the old world feel to them. Thanks for giving her website link. The results are beautiful. I am not a big fan of old processes - most of the time, but what Joni is doing is different. She is not pretending to step back in time. She uses an old process but this is just a technique - her photographs are very modern - maybe mostly because of the subject. I love this combination. My new favorite book!!! And artist!